Primera Plastics, Inc. produces precision plastic injection moldings. Founded in Zeeland in 1994 by Noel Cuellar, the company’s primary clients are in the automotive industry, but it also produces moldings for furniture and medical furniture manufacturers. Primera Plastics ships most of its products across the U.S. and to Mexico, although it also maintains relationships around the globe. The company’s 40,000 sq. ft. distribution center and 68,000 sq. ft. manufacturing facility house more than 130 employees. Both facilities were constructed in the early 2000s. Plans call for the expansion of the manufacturing plant within the next year. 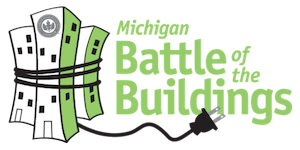 This was Primera Plastics’ first year competing in the Michigan Battle of the Buildings. Both the manufacturing facility and distribution center were entered, the latter earning the accolades in this year’s competition. Pictured from left to right: Cheri Holman-USGBC West MI, Rachael Koops-Primera Plastics Inc., and Bambi Hollingsworth-Primera Plastics Inc. The company has taken deliberate steps to reduce its energy usage and become more environmentally friendly. Midwest Energy Group, which specializes in energy management and efficiency, came onboard as a consultant. This partnership, along with participation in several Battle of the Buildings webinars and educational events, enabled Primera Plastics to discover several innovative ways to save energy. During the 2016 calendar year, the company reduced its distribution center’s energy usage by 23.67 percent. It achieved this notable distinction not by investing significant capital in large projects, but instead by taking several small steps. One project focused on retrofitting its distribution center’s lighting fixtures with LED systems. Another involved cycling off unused machines and equipment. With Midwest Energy Group’s help, the company systemized which machines and equipment could be powered on and off at specific times to avoid wasting energy while still maintaining productive operations. Other projects included repairing air compressor leaks and unplugging unused equipment. Primera Plastics’ LED retrofit earned a $2,200 rebate from the Zeeland Board of Public Works’ Commercial & Industrial Energy Efficiency Program, an incentive tied to Energy Smart, a Michigan energy efficiency rebate program. “Just knowing we are doing our part to be green is rewarding to Primera and our employees,” says Bambi Hollingsworth, Director of Operations. Plans for 2017 include the installation of LED lighting in the manufacturing facility and corporate offices, as well as continuing to explore new ways to maximize energy savings.